I created this insert purely out of necessity. I've changed my diet in the last couple of months and I'm losing weight - that's the good news. It has improved my blood sugar to the point that I don't need as much insulin, but getting that adjusted has not been easy. Waking up in the middle of the night with low blood sugar is not fun! 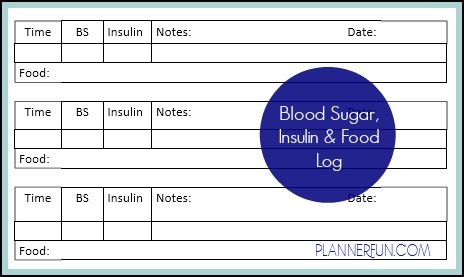 I decided I needed to document exactly what I'm eating, how much insulin I'm taking and what my blood sugar is as a result. If I continue to have problems, I'll take this into my doctor so he can instruct me how to take care of it.